Discussion or informational site published on the World Wide Web and consisting of discrete entries ("posts") typically displayed in reverse chronological order (the most recent post appears first). Until 2009 blogs were usually the work of a single individual, occasionally of a small group, and often were themed on a single subject. More recently "multi-author blogs" (MABs) have developed, with posts written by large numbers of authors and professionally edited. MABs from newspapers, other media outlets, universities, think tanks, interest groups and similar institutions account for an increasing quantity of blog traffic. The rise of Twitter and other "microblogging" systems helps integrate MABs and single-author blogs into societal newstreams. 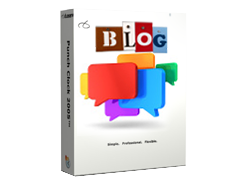 Blog can also be used as a verb, meaning to maintain or add content to a blog. Blog website helps you discover the best in blogs. Quickly and easily findable blogs by category and topic or read daily blog roundups of some of the best blog content around the Web. Help to discover new blogs and to create visitor's own Top 10 lists to share with the community. In simple terms, a blog is a website, where you write stuff on an ongoing basis. New stuff shows up at the top, so your visitors can read what's new. Then they comment on it or link to it or email you.